Hotel Eco Paraiso, located within the Special Biosphere Reserve of Celestun on the northern Gulf of Mexico, on the Yucatan Peninsula can offer couples looking for a different, very special experience, a traditional Mayan wedding ceremony. 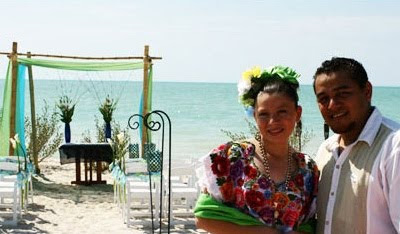 The eloquent and emotive ceremony, performed on the beach by a Shaman priest is in accordance with ancient Mayan wedding customs. A civil ceremony, including legal documents, can be incorporated. The Mayan Wedding package includes two nights’ accommodation in an oceanfront junior cabana suite, all meals and non-alcoholic beverages, a massage for the couple, a candle-light dinner with a bottle of champagne, a welcome cocktail and transfers plus all details covering the ceremony in traditional dress, flowers, special décor and music plus relevant items coordinated by a wedding planner. The rate for the Mayan Wedding is $2,500 per couple including tax. An additional $500 is required to cover a civil ceremony. Extra nights for the honeymoon and for wedding guests are $330 per couple, including all meals and taxes. The “Eco-Chic” hotel, which features 24 individual cabana suites all with private terraces, complete with hammocks, providing expansive views of the Gulf of Mexico, was carefully created within the ecologically sensitive area. Situated feet from 3 miles of pristine, shell-filled beach, the area is a main feeding ground for the Pink Flamingo, Pelicans and many other sea birds as well as a breeding ground for sea turtles. The property includes the newly constructed Restaurant Xixim and bar El Santuario plus a fresh water pool overlooking the Gulf and a wellness center which offers a juice-therapy feature, massages and gym. The resort offers multiple choices of local tours which allow guests to explore the archaeological wealth including the Mayan ruins at Uxmal as well as the unique ecosystem of the Yucatan. Hotel Eco Paraiso is best accessed through the international airport in Merida, which has flights direct from the U.S. as well as through Mexico City with a 90-minute arranged transfer. See Weddings at Eco Paraíso XiXim for more information.